I have finally gotten around to doing the second part of my peppa pig post. I thought Miss Rabbit deserved a post to herself since, well, what can I say… she puts the rest of us to shame, working all those jobs, raising kids and still finding time do to charity work. First off why is she called Miss Rabbit, if she is Mummy Rabbit and Miss Rabbit why do they not always call her Mummy Rabbit as all characters always call Mummy Pig Mummy Pig not Mrs Pig! I believe that Miss Rabbit and Mummy Rabbit are the same. I haven’t heard Richard or Rebecca Rabbit call her Miss Rabbit? Also regarding Mr Rabbit, perhaps he and Miss Rabbit are not married – hence Miss, but they share the same surname as they are rabbits, and all the characters surnames are the name of the animal they are. Do they live in sin, a sign of the times. You don’t need to be married to have kids, you go Miss Rabbit. Miss Rabbit has the most jobs of anyone I knowor indeed just anyone. Maybe with the exception of Kirk from the amazing Gilmore Girls. She works at the Museum, the Supermarket, and the shoe shop. She is also a dental nurse, a librarian, runs the Recycling Centre, drives the train, sells ice cream in various places, entrance tickets at ‘Duckland’, and hires out skates at the pond when it is frozen. She sold Mummy and Daddy pig their Christmas tree. She helps at school events such as the jumble sale and the school fete (where she paints faces), and drives the school bus. She also pilots a hot air balloon. 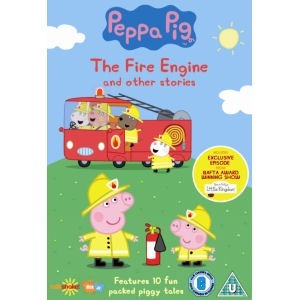 Not to mention she runs the Fire Station, where she is helped by Mummy Pig, Mrs Dog, Mummy Sheep and Mrs Pony. Not forgetting she also moonlights as the voice of Nanny Plum from Ben and Holly on her days off. Has she found a clonning machine? Maybe there are more than one Miss Rabbits? Or maybe she just likes to buy lots and lots of shoes and is paying off a huge debt. The other parents from Peppa pig, seem to manage to hold down one job. But I think Miss Rabbit is hot on their heels if they are tardy. Daddy Pig works with Mrs Cat and Mr Rabbit in a top floor office. Mr Zebra is the Postman. Granddad Dog runs the local garage. The local GP is Dr Brown Bear. Mr Bull is a bin man. Mr Pony is the Optician. Mr Elephant is the Dentist. Madamme Gazelle is the nursery teacher. What I want to know is, how does she spend any time with her children when she works so many jobs? And where are her children when she works all these jobs? I am hoping she just temps and only works at these jobs once. Maybe she has lots of holidays and spends plenty of time with Rebecca and the whiney Richard. Who knows. One day I will find out…. The episode 'Miss Rabbit's Day Off' clearly shows that Miss Rabbit and Mummy Rabbit are, in fact, sisters. AhhI haven't seen this episode but thanks I will check it out. I'm delighted someone mentioned Ben Elf being Simon squirrel! I knew I had heard his voice regularly somewhere else but I couldn't place it – was sending me mad! I never twigged about Princess Holly though, must listen next time! Mummy rabbit and miss rabbit are not the same. They appeared in one episode where miss rabbit twisted her ankle and mummy rabbit and the rest had to do all miss rabbits jobs.